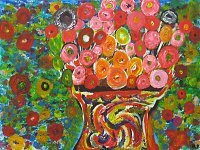 The Open Hearts Gallery, a member of the Greenville Metropolitan Arts Council, is a dynamic gallery featuring the talented artwork of people who live with or have recovered from mental illness. Art is a powerful representation of the person within - his or her pain, recovery, and triumph. The gallery serves as a bridge to combat stigma and as a reminder of how resilient and simular we all are. Participants use a variety of artistic media as a means of expression and recovery. The vibrant, striking pieces each artist creates not only relect the breadth of skill and range of experience of the artists, but also bring a message of hope to those who view them. The gallery is part of Greenville Mental Health and the South Carolina Department of Mental Health's Art Of Recovery project. All proceeds go directly to the individual artists.